This was my third trip to work with the KamiAmi Women. Pokuase is feeling like a second home. Some things in Pokuase are the same. The main road from Accra is still not done. The dirt road that leads from the place I stay to the place I work (a 30-minute walk) is still only partially finished. It is hot, dry, and dusty. A cold beer at the end of the day is really refreshing. The three weeks were filled with ups and downs, frustrations and satisfactions. Some days it felt almost impossible to achieve what I had hoped for - a reliable source of income for these very poor women. We are battling so many things, with the Ghanaian culture itself presenting some of the major obstacles. On other days, there were both major and minor miracles and we, the KamiAmi Women, seem to be on our way. ​The best miracle of all is that we completed and delivered our very first wholesale order - 55 crocheted and zippered wallets. Global Mamas buys fair trade crafts made by Ghanaian women. They will test market them at their two tourist shops in Ghana, and, if successful, they will include our bags on both their Web site and in their international catalog. If this is successful, it is the utmost in sustainability. The women simply take the trotro (public transportation) to Accra to do their KamiAmi business. ​Our second stop during our “make market” day in Accra was at a small and very lovely tourist gallery, Sun Trade. Kati, the owner, had sold four of our bags that we had left on consignment in August. She placed a wholesale order for six of our larger bags, and wants us to design a smaller bag for her gallery to use to package the jewelry she sells. And she will order 60 of those!! 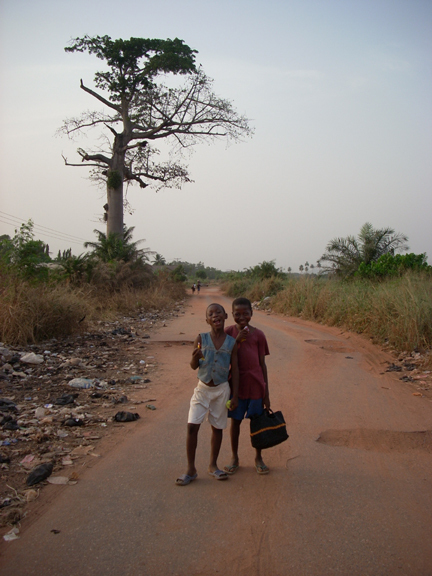 We were filled with smiles as we traveled around Accra, collecting money and orders. Sammy has started to recruit more women. These are young women with little schooling and few job prospects. A perfect group for us! On my next trip I plan to institute a program that will pay the women to enable them to attend our training program. Sammy will also continue the development of the recycling portion of our program, an essential part of our project. ​​KamiAmi continues to change, to progress. Each frustration presents another obstacle to overcome. I am learning. It is a bit like raising a child - when and how do you start to let go? Let them fall and make their own mistakes? Make decisions that are culturally correct? Make yourself and your goals understood? Take actions that make a point? It is a challenge. As they say in Ghana, "We have tried." For the fun of it, I continue my art projects with the local Pokuase kids. About 30-40 of them show up twice a week after school. Some of the older kids and I made blank stitched books. Every child was welcomed, and got a blank book – in which to write, or draw, or do whatever pleased him/her. On the last day, the books and “colors” are theirs to keep. Some of these kids never receive anything special at all and are so very grateful. It is a pleasure to share even a little with them. Special thanks to Tania Zouikin for making this trip possible.